Extensive green roofs tend to have a thinner growing medium than intensive green roofs.They therefore require less maintenance. As they are lightweight, they are easier and less costly to install. In general, they do not require irrigation although some irrigation may be required initially. There is a misconception that green roofs are made of grass-based turf. Although some green roofs are made of turf, this is not generally the case. Sedum Mats have a base layer of polyester, hessian, or porous polythene, depending on the supplier. A 20mm layer of growing medium is laid and sedum seeds or cuttings are spread across it. These grow into the substrate as they mature. When harvested, the sedum blanket is rolled from the carrier and delivered to site. When installed, the sedum blanket including the 20mm of growing medium is rolled out onto either 50mm – 70mm of growing medium (standard method) or directly onto a moisture retention blanket (ultra light-weight method). Because they absorb water, sedums are commonly used on green roofs. Furthermore, they are drought and wind tolerant. These extensive green roofs generally have 80mm of substrate. The substrate is usually an aggregate mixed with about 20% organic material. The substrate sits on the green roof system (filter sheet, drainage layer, protection layer). The vegetation layer consists of sedums and wildflowers. Nevertheless, brown roofs are still being specified and installed. Recent research and experience has shown that commercial crushed brick or other porous substrates help to ensure quality with known water storage capacity. Therefore, this type of roof will need higher organic content to ensure that the wildflower plugs or seeds to be specified can flourish. In light of this, extensive green roof substrates have about 20% organic material. 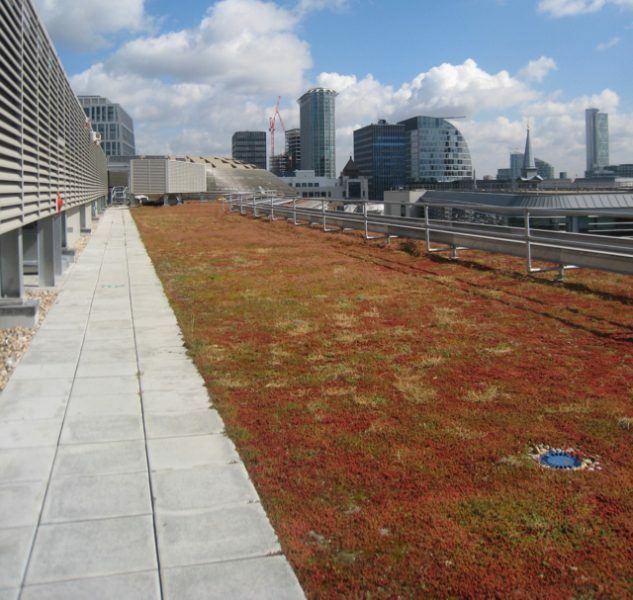 This is in keeping with the Green Roof Code and is covered in detail in this Best Practice Guide. 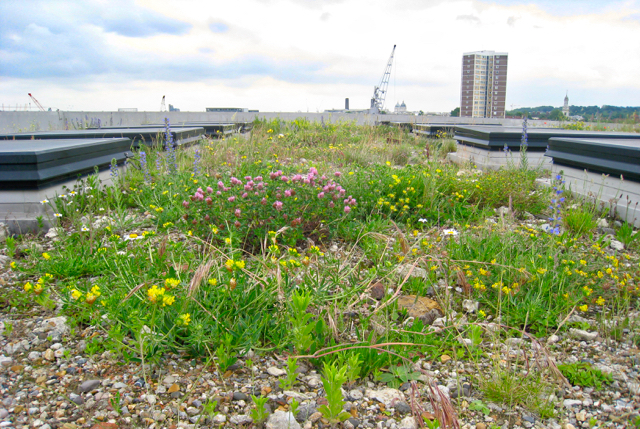 For these reasons, the biodiverse green roof approach is the commonest approach in the London area. 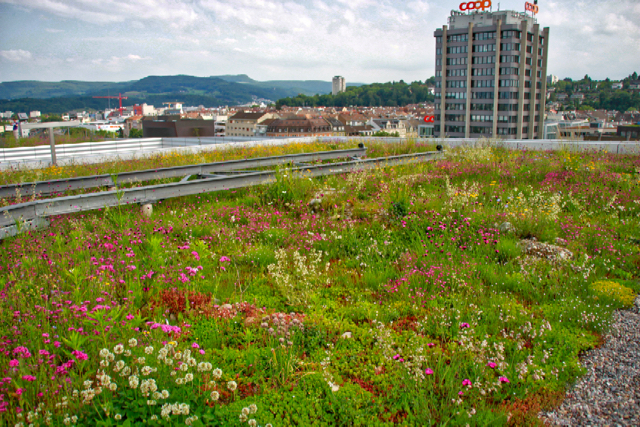 In general, biodiverse green roofs use native plant mixes. However, they can also include a range of sedums as part of the plant palette.